It’s the middle of the holiday season and probably one of the most stressful times of the year. From shopping to decorating to sending out those darn festive cards, people are in need of some form of decompression. 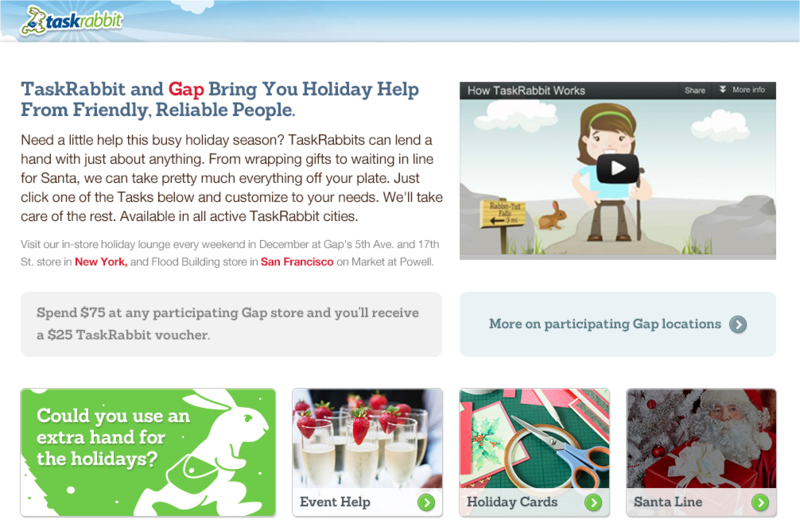 To help alleviate the stress,Gap, the retail clothing store, has teamed up with TaskRabbit to help make the season brighter. Starting Saturday, December 8 through January 1, 2013, customers can go to one of eight Gap stores in the San Francisco Bay Area or in New York City, spend at least $75 and receive a $25 gift voucher that can be redeemed for TaskRabbit services. 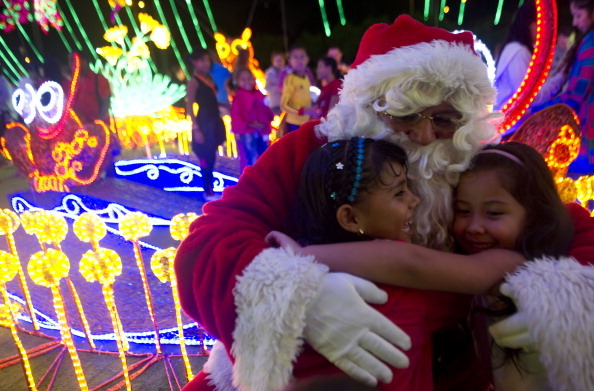 It can be for one of five holiday-related tasks or anything else that they need taken care of. The vouchers can be redeemed in one of two ways: at a retail location in San Francisco (its 890 Market Street location) or in New York City (its 122 Fifth Avenue location); or it can be done online. Should the customer choose to redeem their gift voucher at one of the two Gap retail stores in SF and NYC, they will find a concierge desk waiting for them every weekend in December through January 1. Decorating: every holiday, a TaskRabbit is hired to help with the decorations, which may also include the outside of houses. Depending on how detailed the work, interior decorating could be between $50-100 while the exterior is $85-200. Gift Wrapping: this is a popular task with the service — typically the cost for this would depend on the amount of gifts needed to be wrapped, but TaskRabbit estimates it to be between $25 to $50. Holiday Shopping: TaskRabbits can be hired to help with the shopping — posters put together a list of people to buy gifts for, explain what things people are interested in, and send the TaskRabbit out to get it. The price runs an average of $150-200. Holiday Grocery Shopping: you can’t have a good holiday gathering without food — TaskRabbits can be hired to do shopping to make sure all ingredients and food is purchased, with average cost being around $45. Christmas Card Writing and Addressing: have someone help you address all your Christmas cards with a task that averages $20-40. Holiday Party Help: if you’re having a holiday party, bring on a TaskRabbit to help greet people, serve as bartenders, prepare and serve food, clean up, and more, all for an average price between $50-200. Tree Removal: once the holiday season is over, so too is the need for that Christmas tree. Don’t wait until the middle of next year — hire a TaskRabbit for around $50-75. Why is TaskRabbit giving out $25 vouchers? It says that it’s the average cost that people would pay for the holiday tasks that are being offered on the Gap’s landing page. In addition to the concierge desks, customers will find photo booths at both San Francisco and New York City locations. TaskRabbit photographers will snap photographs of customers with families and Gap gear will be included in case anyone wants to be creative with their photos. No, the gear isn’t given away, but you can definitely purchase it. TaskRabbit says that Gap approached it two months ago to help engage customers while promoting its “Love Comes In Every Shade” holiday campaign. The retailer had a desire to make the next few weeks easy on customers and give them a chance to offload those stressful and mundane tasks to others. But this isn’t the service’s first dance at the partnership rodeo — it recently completed a promotion with Pepsi Next and earlier this year, worked with Bravo TV to launch its Austin market. It also was involved with First Round Capital’s Cyber Monday promotion and known for it’s program to deliver In-N-Out Burgers to the San Francisco public. Started by Leah Busque, TaskRabbit has raised nearly $40 million in funding and has seen its task volume increase “four-fold” while revenue has “quintupled”. Although this holiday partnership is available only in SF and NYC, the service has operations in Boston, Chicago, Seattle, Portland, Austin, San Antonio, and Los Angeles/Orange County. It will be moving forward with more US destinations in 2013, in addition to its first international locations, like London and Vancouver.